People ask me often, 'Why do you write in a dying language?' And I want to explain it in a few words. Firstly, I like to write ghost stories and nothing fits a ghost better than a dying language. The deader the language the more alive is the ghost. Ghosts love Yiddish and as far as I know, they all speak it. Secondly, not only do I believe in ghosts, but also in resurrection. I am sure that millions of Yiddish speaking corpses will rise from their graves one day and their first question will be: "Is there any new Yiddish book to read?" For them Yiddish will not be dead. 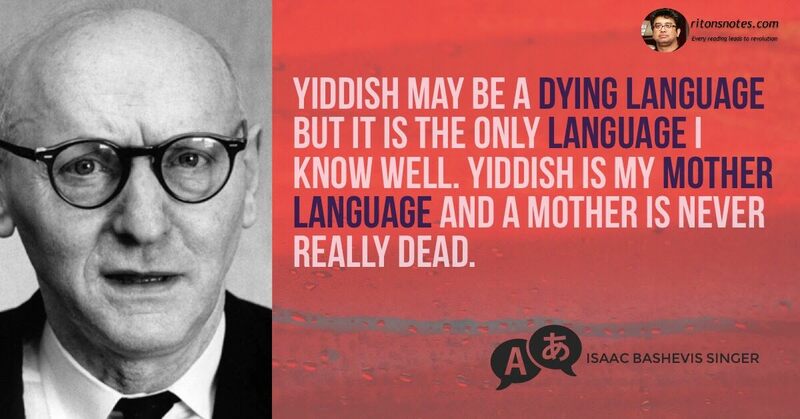 There is still a fourth minor reason for not forsaking Yiddish and this is: Yiddish may be a dying language but it is the only language I know well. Yiddish is my mother language and a mother is never really dead.